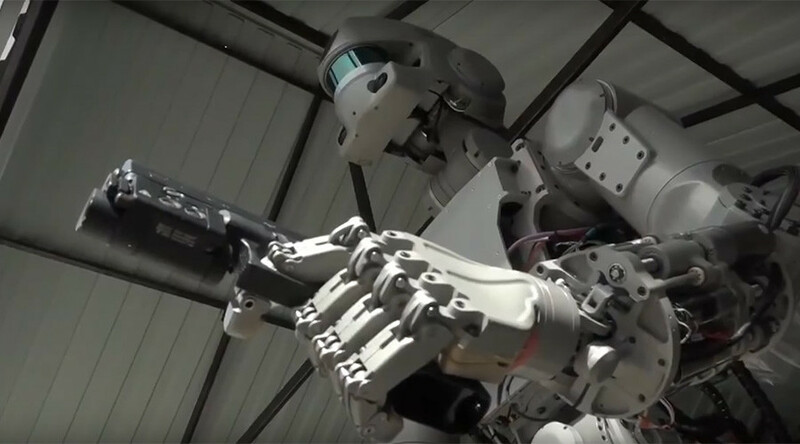 Russian humanoid robot FEDOR has been taught to dual-wield pistols, adding one more skill to his already impressive list. Vice Prime Minister Dmitry Rogozin has shared videos of the android’s exercises on Twitter. FEDOR (Final Experimental Demonstration Object Research), which is expected to go on a solo space mission in 2021, can now hit the mark with a gun in each hand. “A robot of the F.E.D.O.R. platform has shown skills of shooting with both hands. Work is underway on fine motor skills and decision-making algorithms,” Rogozin tweeted, attaching a picture of the humanoid robot. He also posted a clip featuring the combat robots, “guys with iron character,” which he believes are the key to creating intelligent machines. Although FEDOR doesn’t look much like a human, his designation acronym is also a Russian male name. He has already learned to use keys, extinguish a fire, drive a car, and use a saw and a welding machine. All of these skills will, hopefully, prepare FEDOR for one of its biggest future tasks – to go to space aboard the Federation spacecraft in 2021. Created in 2014, FEDOR was initially aimed at replacing humans in high risk conditions, including rescue work. One of the developers of the project, the Russian Foundation for Advanced Research Projects, announced a competition to create a software design for individual control for FEDOR. The contest will start on May 1 and run till February 28, 2018.